Hi, thanks for checking in and welcome to my King Fire Baby website! Bare with me as this is a work in progress, but I figured I needed to start somewhere. Just a little background on KFB (not to be confused with KFC), I’ve always been into cooking and creating crazy concoctions, especially with my Cambodian background. Khmer cooking is a wonderful fusion of flavors and spices that will blow your mind away. Also, it doesn’t hurt to have great foodie friends as guinea pigs. I’ve created a number of interesting dishes, especially with my marinades and sauces. Last year, I was able to debut a King Fire Baby booth at the Cleveland Asian Festival, and wow, I had no idea that it would be such a huge hit! I featured my KFB Pork Ribs, Pulled-beef curry sandwiches, Lemongrass Chicken wings and a number of other fun dishes. I had so much fun that I think I’ll have to attempt the feeding frenzy again (we had over 34,000 people attend). So stay tuned for more King Fire Baby…the fun has just begun! Cleveland Asian Festival 2012 on WKYC.com Wayne Wong, Master of Ceremonies, being interviewed about the festival and history of the event. Cleveland Asian Festival on Channel 3 News! Ying Tang, Executive Committee Co-Chair, being interviewed on what the festival is all about! 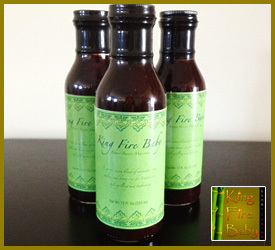 Follow King Fire Baby on Twitter and Like on Facebook!